Housed in a Bakelite cabinet and using 18 Mullard valves with a 9-inch CRT (Cathode Ray Tube) this set was designed to operate from AC mains. The TV12B was the Birmingham equivalent to the 'A' which was for London only. The only difference being the tuners, which were interchangeable. An autoradiogram version was available with a 12-inch tube known as Model TRG12A. Magnifiers could be purchased that were filled with liquid and strapped to the front to magnify the size. In April 1949 the TV12 cost �41.3s.1d PT extra. This set has the squarer shaped picture mask we would expect to only see on the TV12. 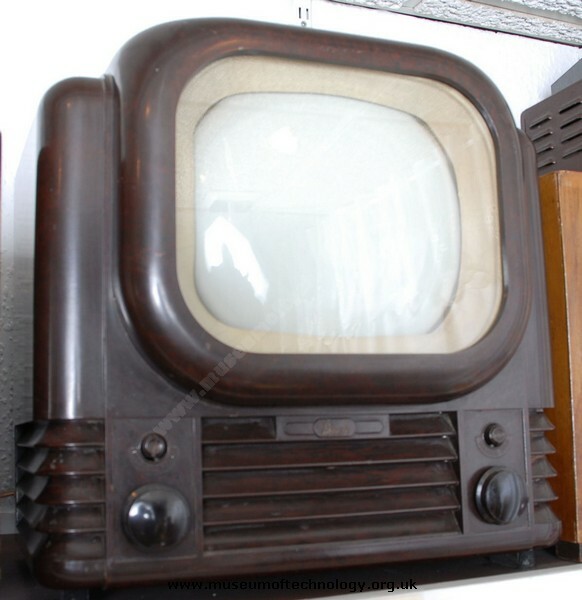 This could be fitted with a Band III converter in 1957 to receive ITV which started transmission in 1956.